Ask any health professional and they'll tell you that upper arm blood pressure monitors offer the highest level of accuracy and reliability. Now you can the reap benefits of an upper arm blood pressure monitor without having to inflate the cuff by hand or use a stethoscope. 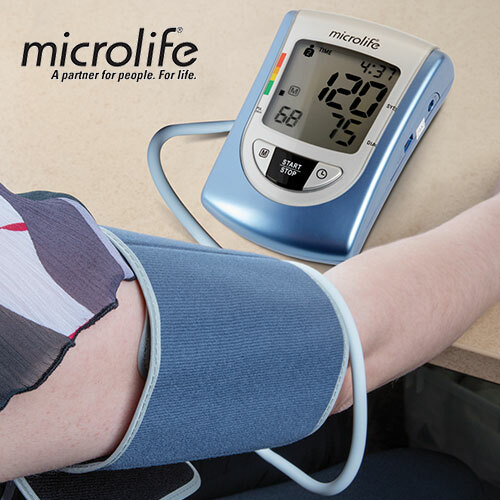 It's easy with this fully automatic, user-friendly MicroLife Deluxe. At the press of a button it measures systolic & diastolic blood pressure as well as pulse rate, then displays readings on a large LCD display. Plus, it stores up to 99 measurements for two users and comes with Blood pressure analyzer software that graphs, charts & lets you share your results with your physician.